germ@namur: Cologne, the perfect city for an Erasmus : Viva Colonia! 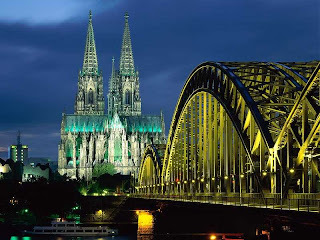 Cologne, the perfect city for an Erasmus : Viva Colonia! When I was told I were to go to Cologne for my Erasmus, I thought it wouldn’t be as exciting and interesting as in Berlin or Cork, the far away destinations. But I was quite wrong! And you too if you have the same impression. Even if it was only 250 km away from my house and took only 2h30 by car (but by trains my personal record is about 7 hours…), Cologne is though rooted in another country, another language and another culture! But let’s start with the beginning of that adventure! I’ll skip the boring administrative details, not so important, and go directly to the arrival in the most famous city of Nordrhein-Westfalen. I went there only a week before the beginning of the classes but I recommend to next Erasmus students to go there more or less one month in advance to familiarize yourself with other people living near your student room, the city, … Anyway you can’t be bored because so many things need to be done and seen! Moreover the winter semester in Germany begins only mid-October, i.e it is very short (only 2 months till the Christmas break!!!) and if you don’t go earlier, you will have the same sad impression as me, namely that you hadn’t the time to completely enjoy it! 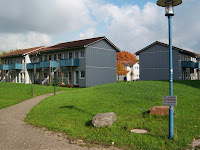 I don’t want to say I didn’t enjoy my Erasmus because I lived there a marvelous dream but I regret it wasn’t longer. During the first weeks we had big difficulties to cope with the choices of courses and the credit points, still not really used by the Germans. I felt very lost in that huge city, far away from everything and everybody I knew. But as the weeks passed, we solved our problems of courses, we met very kind people from all over the world and we got used to the German habits and culture. Do you know how much the German greetings are complicated? Okay I’m maybe not the right person to speak about this because I still don’t really know how to greet everybody and in all contexts but I can give you a piece of advice : Wait to see what s/he will do and simply imitate him or her. But please don’t give a kiss at first (especially to a boy) because he could misinterpret it and think you want more… Hopefully it didn’t happen to us. We ‘ve always managed to stop our nearing tendencies early enough! So what especially did I do there with Joyce? Well we had a lot of fun of course, our student rooms were in the same house with the nicest German girl ever and the worst Chinese girl ever too… But this is also another story. I’ll only tell you she was the worst flatmate I have ever had and that she got so much on our nerves that we had to control ourselves not to strangle her… So that was our nice experience with the Chinese culture. Hopefully we met other people with other nationalities. We were all in an Erasmus atmosphere and we had great time together. So all of that was really great fun but what I really really enjoyed and made my Erasmus stay so terrific was the scout unity I met there! You cannot value this if you’ve not lived it! Like Benjamin I took the steps to live a scouting Erasmus and I was not disappointed! It was really the best way to have contacts with local people and go outside the student life for a little time. I lead about 10 little monsters (the boys) and 3 little angels (the girls!) each Monday afternoon and each Monday evening I was invited to go to the meeting of leaders. That was always great! I had a lot of fun with them, either because we spoke about the prejudices about Germany and Belgium or also because they tried sometimes to speak French but made pronunciation mistakes and so said other words, not always in their advantage…. inter@lesscouts.be and you have the guarantee of a perfect Erasmus stay! 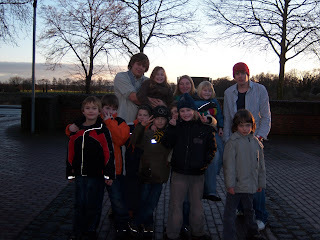 After all I lived with my german unity (each Monday, some parties, a scouting week-end, some Sundays and even a real mass in the Kölner Dom) it was very difficult to leave them. I met there really friendly guys, whom I’m not ready to forget! And anyway it’s already planned we see each other once again because they invited me to go to their summer camp in Romania, and as this whole Erasmus experience has taught me : don’t waste your luck, don’t be afraid and go!